Learn the fascinating art of seamless, three-dimensional wet felting. No knitting or sewing required, use wool roving and other natural fibers to felt a small vessel to hold flowers, keys, chocolates, or to simply brighten up any shelf. Choose bright or natural colors, then “sculpt” your vessel into any shape from organic to contemporary. We’ll be working with water, so dress for mess. Approximately 6" x 6" x 6", each piece is unique! A simple twill pattern with self-made, wrapped handles. Classic, beautiful and functional ---- What more needs to be said? Advanced beginner - students ready to try a simple twill. 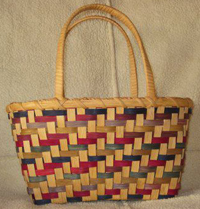 This basket uses a 10 x 12 "D" handle and twill weave to create a beautiful basket to carry your filled 9 x 13 casserole pan. It is perfect for carrying cakes, bars or a hot dish to a gathering. This is a rugged and sturdy basket. Gather applies, display pine cones, stuff with yarn, sewing, etc. Hang from a hook and see the unique design on the bottom. A sure favorite to use regularly. Pattern owner: designed by Helen Mitchom. 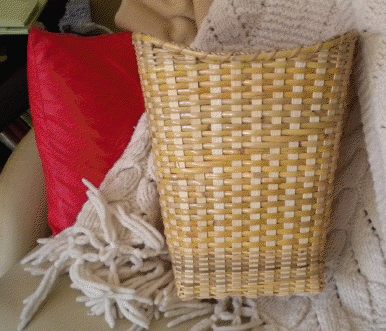 This large basket is well suited for use as a hamper or for blanket storage. 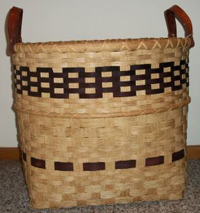 Experience working with larger size baskets is a plus, but your desire to create a functional large basket is necessary. Note it does have 2 rims to complete and leather handles. This beautiful vase is taught with the permission of its creator, Susan Coyle. 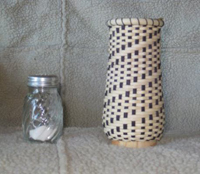 A lovely twill pattern spirals up the sides to form a functional vase around a glass container. Fun to weave, beautiful to use. 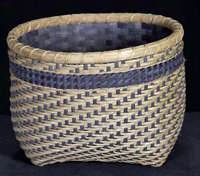 This Shaker Cat’s Head Basket has a solid green inner basket with a twill woven on the outer basket. If time permits, students can add a band of French Randing. 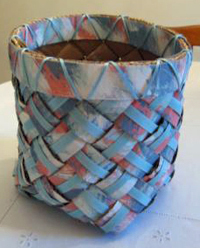 Made almost entirely of recycled materials, this basket is woven of hand-painted cardboard, decorated with colorful shipping tape or nylon cord. Weavers may choose from sets of cardboard strips painted in bright, adventurous colors. Please bring 2 yards of heavy button thread and a large-eye needle to carry it. (The thread won't show when the basket is finished). Also: a hot glue gun if you have one; shears, clothespins, tape measure and pencil. 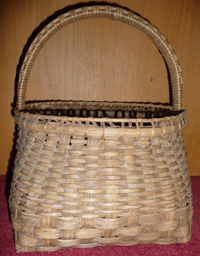 Pattern owner credit: English basket maker, Lois Walpole in "Creative Basket Making"
Very large and sturdy basket due to heavy laced runners running along the bottom of the basket. Different colors available for the accent or make it natural. 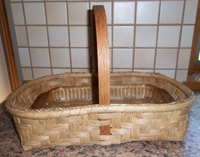 Double hand carved oak swing handles make the basket easy to carry in from the garden. 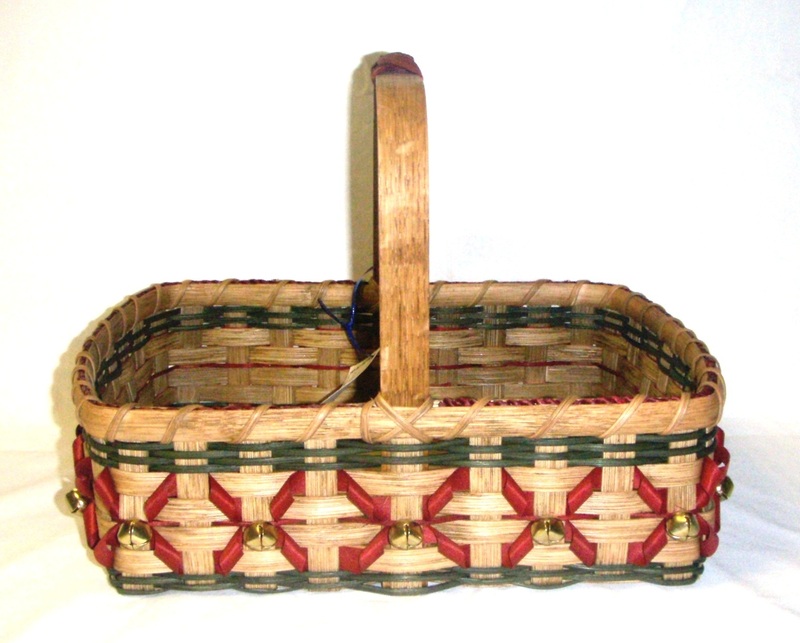 This would also make a great picnic basket due to the double handles for stability. 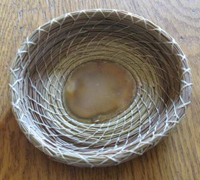 This is an oval bowl/basket made of round reed. It has a square plaited base, twined sides, a top trac border, with a woven bottom border. This cane waste basket has a distinct vintage look. 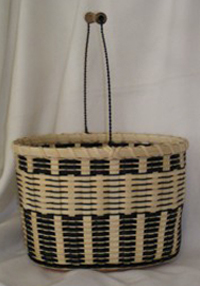 It is woven with a continuous weave on a plastic liner which is included in the price of the class. The pattern is owned by Molly Stahlke. 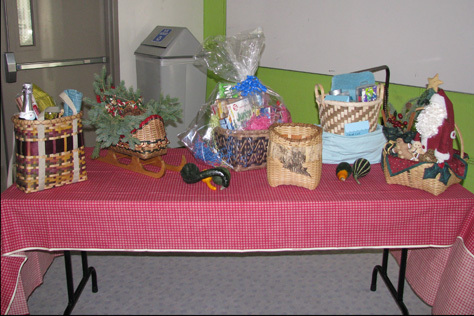 The 12th annual Basket Bingo Fundraiser. Play bingo and win baskets! Come and enjoy fun door prizes, food and a raffle. Bring your friends and family, this event is always a lot of fun! Don't miss it! An eye-catching basket with an ear-catching sound! The center of each Christmas flower is a golden jingle bell. Learn to create curls with maple strips. The filled base woven over a set-in handle will hold even your smallest Christmas treasures. A festive top-knot decorate the handle. Pattern owner: Karen Kotecki. Start this basket with a wood base, attach to a mold and shaping is easy. Then you can concentrate on learning triple twining with a step-up, inserting overlays, and weaving the arrow pattern. Lash with a blanket stitch using wax linen. NOTE: The spokes are glued to the rim row in this basket. Students must bring their own Insta-Set Glue – Purple label, and Insta-Cure accelerator.